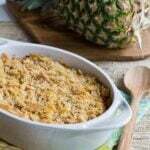 Pineapple Casserole is the ultimate sweet and savory casserole. Both crushed pineapple and pineapple chunks are combined with sugar, cheddar cheese, and a buttery and crispy Ritz cracker topping. It makes a great holiday casserole! Your tastebuds won’t quite be able to figure out what you’re eating with this one. Pineapple Casserole is the side dish that tastes like dessert. 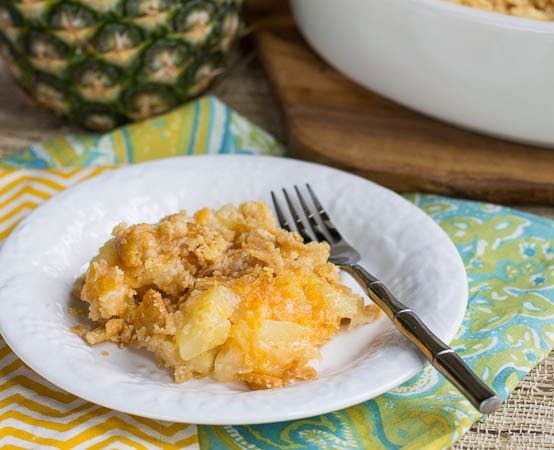 It goes really well with ham or fried chicken, but after one bite of this Pineapple Casserole, you may want to ditch the ham or chicken and just dig into the casserole dish with a giant spoon. The ingredients may seem a little incongruent, but they totally work together. Pineapple Casserole is both sweet and savory. On the sweet side are the pineapples themselves and a heaping cup of added sugar. Yes, you will be getting a sugar rush. On the savory side are cheddar cheese and Ritz Cracker crumbs doused in butter. And no, you do not want to get your cholesterol checked the day after eating this. 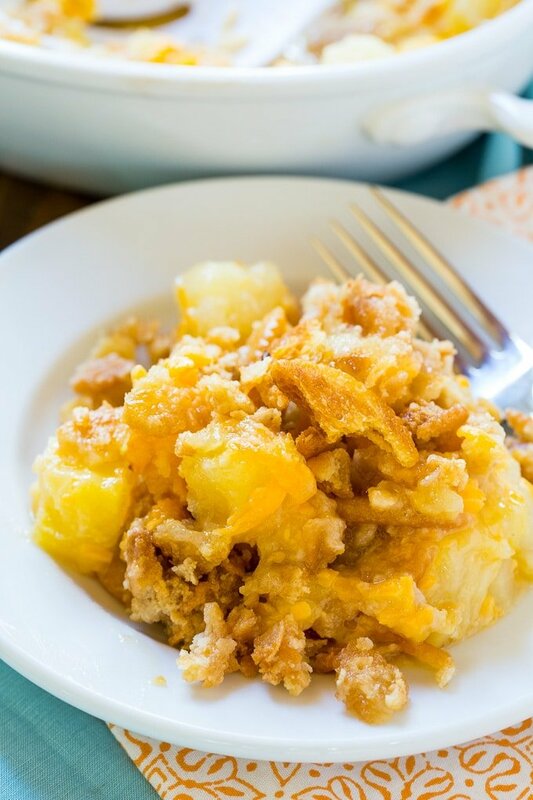 Pineapple Casserole is a classic southern dish, but even in the south, you don’t see it much anymore. I had all but forgotten about it until I had some at Erin’s Restaurant in Rock Hill. It made me want more. Then my husband puchased about 12 cans of pineapple last month when we hosted the annual Crawfish Boil for Charlotte area Tulane Alum because it was a windy day and he needed something to hold the newspapers down on the tables. I’m not sure what exactly possessed him to buy pineapples out of all the canned good options at the market, but to me they had Pineapple Casserole written all over them. I still have a few cans of pineapple left so don’t be surprised if you see Hawaiian Pizza appearing on the blog soon. Note: Pineapple Casserole is best eaten warm from the oven. Preheat oven to 350°. Butter or spray and 9×11-inch baking dish (0r similar sized) with cooking spray. In a medium bowl, mix together flour, sugar, and cheese. The flour will coat the cheese and help keep it from clumping together. Add all of the pineapple to the bowl and mix well. Pour pineapple mixture into prepared dish. 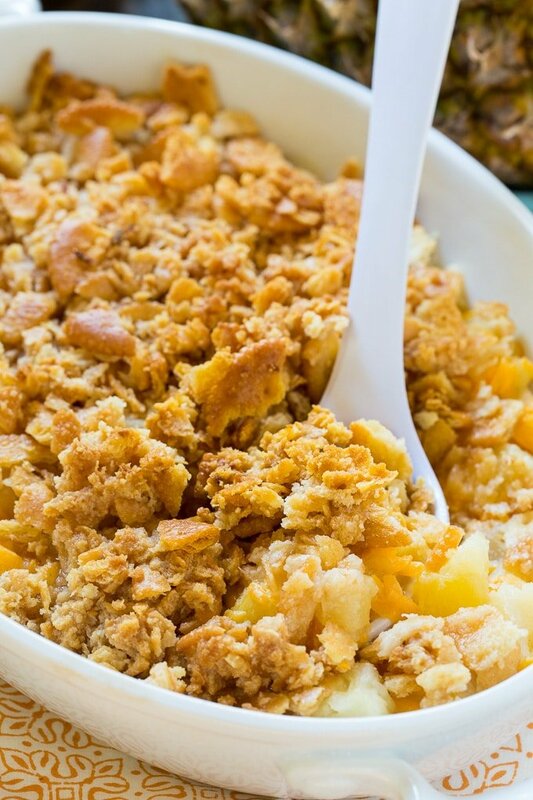 In a small bowl, combine cracker crumbs and butter. Spread evenly on top of casserole. Bake for 30 minutes. You might also like this Pineapple Sheet Cake. Watch the video below to see how to make it. This entry was posted in Casseroles, Side Dishes and tagged casserole, pineapple, southern food, southern recipes. Bookmark the permalink. He also said he had never eaten anything quite like it. He loved it. It is one of my new favorites. It is a keeper!!! I prepped it the day before and kept it in the refrigerator over night until it needed to be cooked on thanksgiving. It turned out a little dry, so if you are going to prep it ahead of time before baking it, I suggest using a little bit more liquid than just from the crushed pineapple. I also mixed tidbits with chunks for smaller pieces of pineapple and it worked out great! I will use 3 8oz cans of tidbits with only 2 being drained next time I make this! This sounds yummy. I was wondering if fresh pineapple could be used ? Had this at an office party years ago every since that time I’ve loved the dish. Came back to the recipe to confirm ingredients, unfortunately I haven’t made this in a few years, but it will definitely be on the table for Christmas. Love this casserole for Christmas! Hope you and your family have a very Merry Christmas! The family would be in revolt if this wasn’t on the table for the holidays!!! Really good stuff! I was thinking about this casserole the other day! I’ve never had it but it seems like everyone I know raves about it. I must try it soon! You really must try it Amanda! The taste is so unique!